M series chambers will provide chamber temperature uniformity within ±0.5°C of setpoint throughout the operating range of 4°C to 40°C. Lighting ranges from 500 µmoles (at 36" from lamps) with the standard fluorescent/ incandescent array up to full sunlight brilliance with optional HID fixtures. 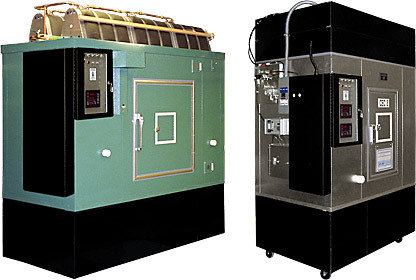 M series plant growth chambers come in a variety of standard sizes. Reach-in units are available in three standard sizes with up to 28 ft2 of growing area. Walk-in units come in sizes up to 120 ft2. Special size walk-in rooms can be designed to meet your particular requirements. Growing Height 48" 48" 60"
Access Door Size 24" x 36" 22" x 35" 2-24" x 36"
Exterior Dimensions 60" x 40" 84" x 40" 102" x 60"
Overall Height 108" 102" 96"
Growing Height 84" 84" 84" 84" 84"
Access Door Size 38" x 76" 38" x 76" 38" x 76" 38" x 76" 38" x 76"
Exterior Dimensions 9'11" x 5'4" 9'11" x 6'11" 9'11" x 10'2" 9'11" x 12'11" 9'11" x 15'11"
Overall Height 104" 104" 104" 104" 104"